Fourteen prime ministers conducted important discussions and made decisions which changed the course of the nation at this desk. What hard-won deals, what visionary dreams, what shattered hopes were witnessed from this well used desk? It had been designed for the Provisional Parliament House (now the Museum of Australian Democracy at Old Parliament House) by architect John Smith Murdoch, when it opened in May 1927. The desk was only replaced when the new extended and renovated Prime Minister’s suite was occupied by Gough Whitlam in 1974. 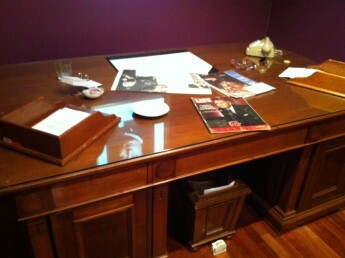 The desk was returned to Old Parliament House when John Howard left office in 2007. When the time came to ‘dress’ this desk for the Prime Ministers of Australia exhibition there was some discussion as to the best timeframe to choose. We decided to reference Harold Holt’s period as prime minister. This is an era not represented elsewhere in the museum and Holt’s departure from this desk for a weekend at the beach is one of the great stories of our nation. 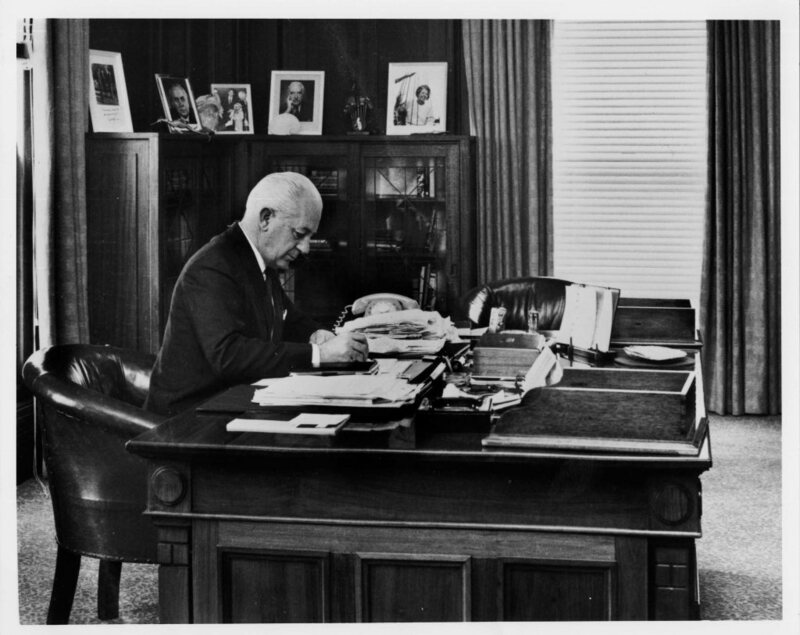 Using the 1966 photograph of Holt at his desk and the personal contents of Holt’s briefcase after his death (now in the National Archives of Australia) as inspiration we have tried to give an insight into a prime minister’s working life. What does it mean to find a modest sandwich plate, a water glass and an ashtray, a comb and a blister pack of headache tablets on the prime minister’s desk? One phone, a desk mat, calendar and a couple of in-trays complete the illusion that he has just gone home for the weekend. Some of the more significant events of Holt’s prime ministership, like the 1967 referendum, the conversion to decimal currency, the Vietnam war and the famous “all the way with LBJ” quote fill the in-trays. The calendar date and scattered seashells speak of a sadder moment. The desk in-situ in the Prime Ministers of Australia exhibition.